The Nordics getting ready for practice! 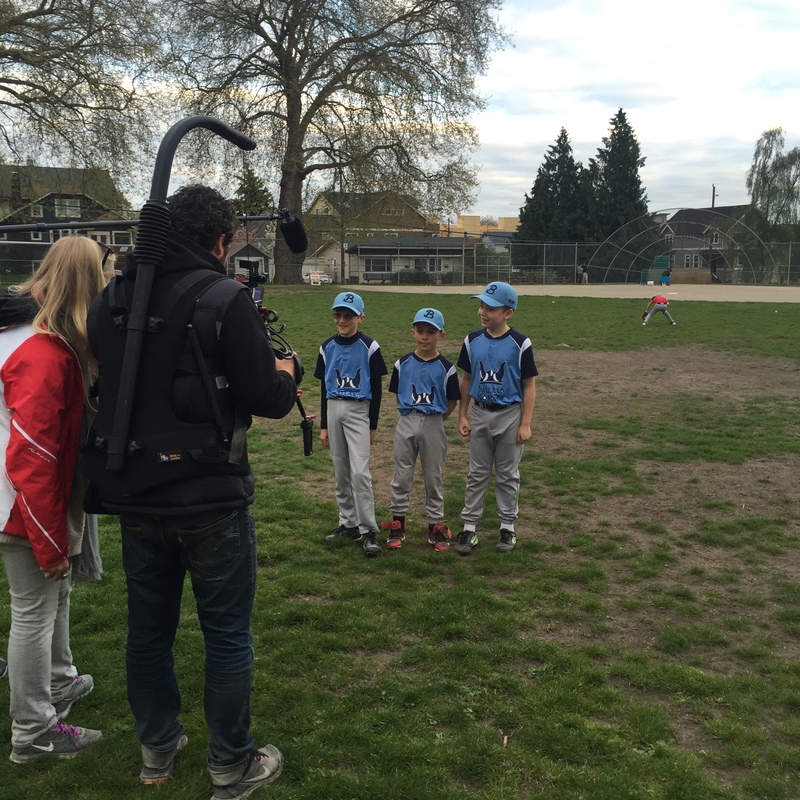 Hometown Shoot Day 1 – And So It Begins! Over 6 weeks after learning I’d been chosen as an Alt For Norge contestant, it was finally time for my hometown shoot! We had discussed ideas and locations for filming ahead of time, but I really didn’t know what to expect. On a beautiful Sunday afternoon a large van rolls up to my parents house in Ballard where we’ll be filming, and out walks the beautiful Anne Lena (director), Per (cameraman), and Peter (sound engineer). 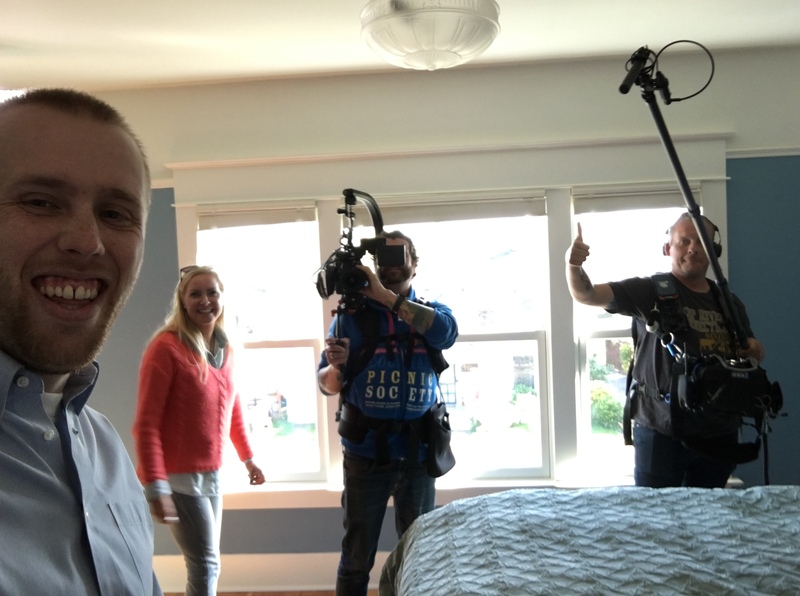 We quickly hit it off, but then get down to business of finding a location to film in or around the home. 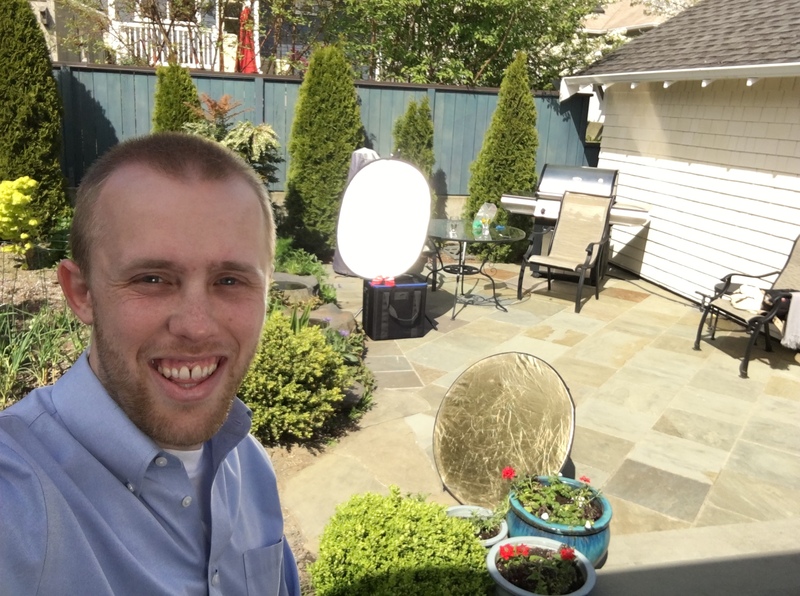 We ultimately settle on my parents backyard, and the boys get to work setting up the camera, lighting, and everything else that will ultimately make my two minute bio happen. As we’re setting up I’m quickly introduced to the realities of “Reality” TV in the best way possible. 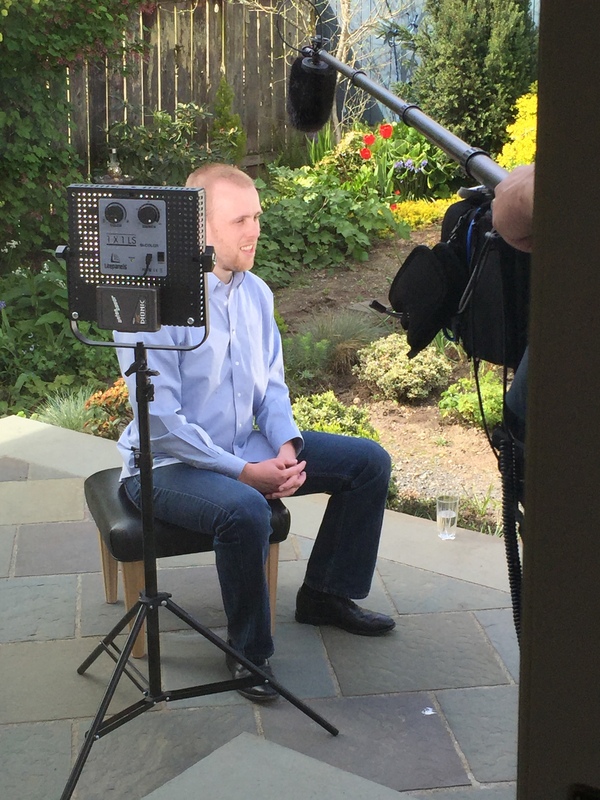 During my interview I’m in focus and the background is blurry – but the green tree behind me was looking a bit bland. We decide to liven up the background by cutting some bright red flowers and sticking them into the green tree – but when that isn’t enough, we realize that red duct tape that looks just like flowers on camera, so we throw some tape on the tree and call it good. The interview portion of the shoot goes great. Anna Lena peppers me with questions for 2-3 hours and I do my best not to come across as a total goofball, though inevitably the producers can pick and choose from so much material they’ll be able to frame me in any light they’d like. The questions are related to Norway, my family, the Ballard Nordics (baseball team I sponsor), my disdain for lutefisk, and what I expect from the show. Across all of the questions, there were none about any specific locations in Norway, except one question they snuck in about Trolltunga which immediately got me very excited. I know they’ve started each season in some pretty cool locations, and while I know very little about Norway’s geography or popular spots, I do know about Trolltunga – a spot I’ve always wanted to go, so at this point all I can do is cross my fingers. Sunburned from 3 hours of fill light! As I talked about in my casting call post, it all starts with Ballard. Ballard has historically been known as a Norwegian hotbed in the Pacific Northwest, playing host to the largest Syttende Mai parade in the world outside of Norway, along with a whole host of other odes to Norway. Seattle is one of Bergen’s sister cities, and King Harald visited Ballard’s Bergen Place as recently as 2015. Yet Alt For Norge has never focused on Ballard or had a contestant from the neighborhood, until now! 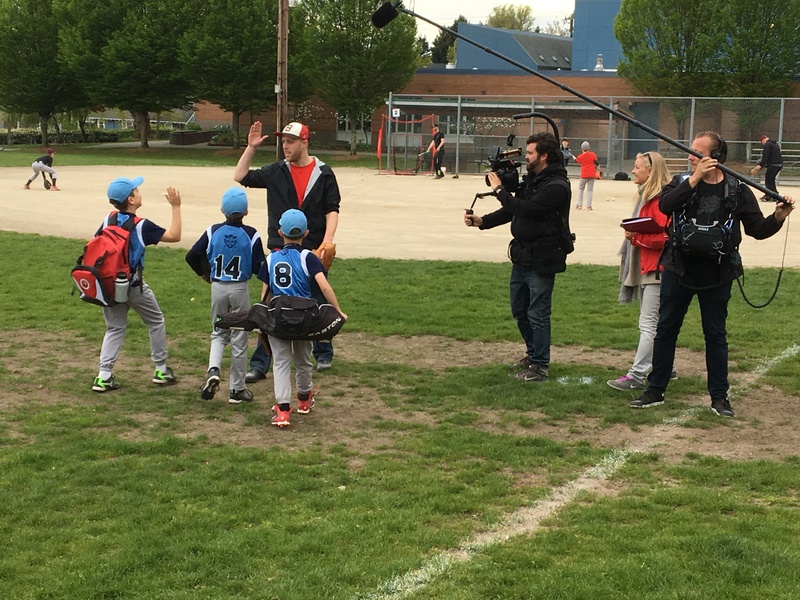 The second day of filming was dedicated to a tour of all that is Norwegian in Ballard! The first stop was the Nordic Heritage Museum, all of 1 block from my parents house where I gave my intro in a room full of bunads! While getting ready to film I came across a flyer that blew my mind… Greg Larsen from Season 4 was going to be giving a talk at the museum about his experiences on Alt For Norge while I was (hopefully still) in the middle of filming! Greg Larsen Ballard Event Flyer! We then filmed right outside the museum by a viking boat and Norwegian mural before moving on to Scandinavian Specialties. From a food standpoint Scandinavian Specialties has it all – kransekake, krumkake, fiskeboller, lutefisk, lefse, you name it! Jennifer, an employee and huge AFN fan typically doesn’t work Monday’s, but changed her schedule to be a part of the filming (she’s the best!) I had to do about 15 takes, but finally nailed my line! Next up was the Son’s of Norway Lodge where I said a few lines with a troll and a bronze bust of Leif Erikson, before we moved on to Olaf’s, a Nordic themed Ballard Bar. I’m a bit embarrassed to admit it, but this was actually my first time at Olaf’s (even if on camera I proclaimed it to be my favorite). My friends Chris and Kate showed up for filming, but rather than being portrayed as my friends, were portrayed as a couple of randos at the bar by my side! To Olaf’s credit, their Norwegian Mare drink featuring Old Ballard Liquor Company aquavit was amazing! Me, Chris, and Kate filming at Olaf’s in Ballard! Note Chris’ Drink Like a Viking shirt! Our final spot for the day was a Ballard Nordic baseball practice. In the scheme of things, I think this is probably the niche that got me picked for this season of Alt For Norge. 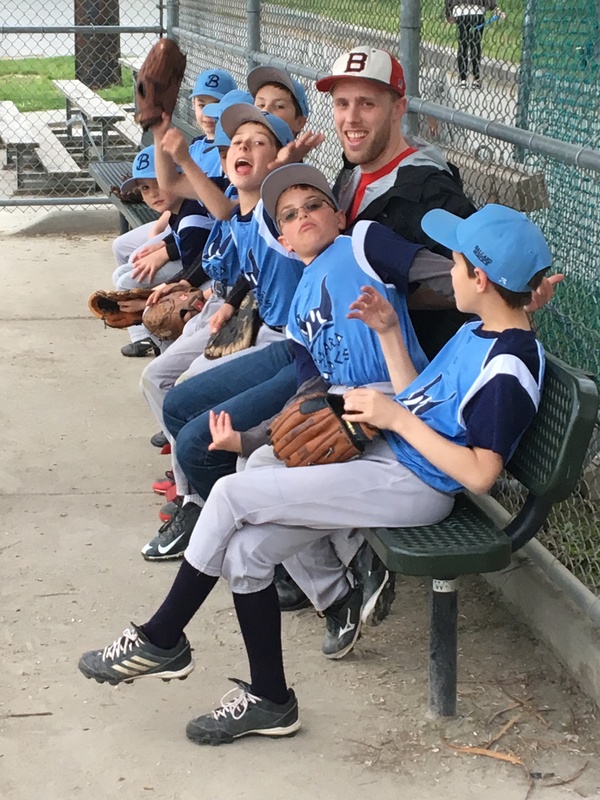 I’ve always been into baseball, and growing up Ballard Little League had a big impact on me, so in 2014 I decided to sponsor my own team. This essentially entails helping offset the team’s costs, but also means you get to pick your team name and design your team jersey. 95% of teams are sponsored by local businesses, but I wanted my team to be something uniquely Ballard, something free from the ties of a business, so I ultimately settled on naming my team The Ballard Nordics. The Nordics are now in their third year of existence, and were getting ready for their upcoming season so the timing couldn’t have been better. In the dugout with the Nordics! The kids were amazing on camera, and frankly will probably be the best part of my hometown bio. After two full days of filming (almost 12 hours total), this was easily the most fun portion of the whole process, and something I can’t wait to see when it goes on air! Until the film crew first arrived, none of this seemed real. Yet now, I’ll be leaving Seattle and headed to Norway in 12 days! It’s starting to set in, this is actually happening! UPDATE: The video is out! They did a wonderful job showing off my hometown, and I couldn’t be more proud of the footage they decided to use! Most of all, I’m thrilled that the map says I’m from Ballard, rather than Seattle or Washington. Nothing makes me happier than Ballard on the map, literally! See the final product below!